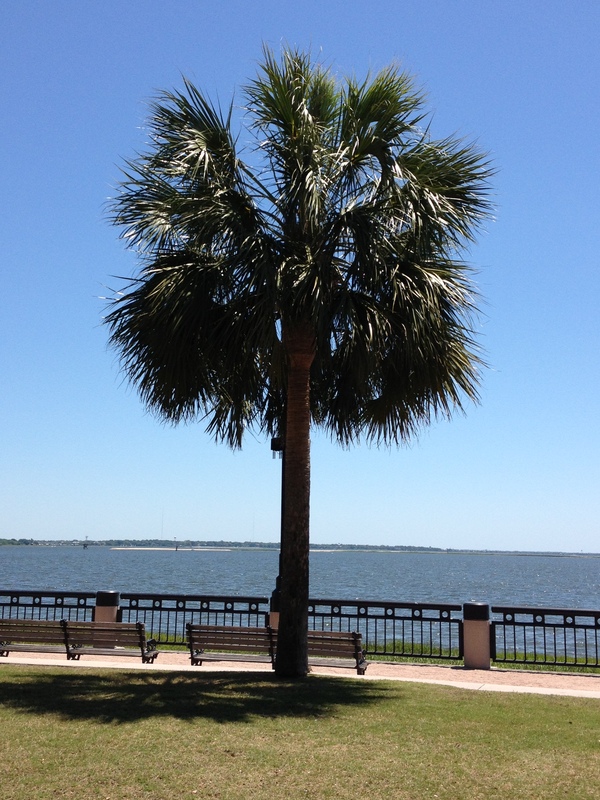 Charleston has been treating me well, my Amazons. And now that the first week is over, I’ve had a little more time to be creative in my kitchen here. I made my way to the Farmer’s Market at Marion Square last weekend and found some amazing local foodstuffs. I will definitely be making the effort to visit every weekend. I’m also fortunate that my gentleman friend came to visit from NYC this week, and I decided to welcome him to Charleston with a special meal. When I was at the grocery store, the ground lamb was calling to me, and I built a meal around that. Much like our last meatball adventure, this takes a little time, but it’s worth it. I think the one item in this week’s recipe that we haven’t used before is shallot. Shallots are related to onions and garlic, growing in clumps like garlic, but having a flavor more like a very refined, mild onion. You can cook them exactly like onions or use them minced, raw in a vinaigrette. Thinly sliced, fried shallots make a lovely garnish on top of meat or salads as well. If you haven’t played with shallots yet, I encourage you to do so! Put your skillet on medium heat with a drizzle of olive oil. Add your minced shallots. Salt lightly and allow to soften before adding mushrooms and salting again. Once mushrooms have cooked down a bit, add the garlic and rosemary. Once the garlic has become fragrant, add the cinnamon, paprika, and some freshly ground pepper. Once all the veggies are soft, fragrant, and just starting to brown, remove from heat and allow to cool. A word about cinnamon. I’m sure a few of you are thinking, “Cinnamon? Really?” If had access to my home pantry, I would’ve added nutmeg as well; but cinnamon adds a really nice subtle dimension to lamb. You’d never guess it was in there, but it gives it great depth of flavor. The Greeks know what they’re doing! Defrost the spinach according to the directions on the package. Of course you could use fresh spinach and chop it and cook it down yourself, but this is a very lovely shortcut that I doubt you’ll regret. You’d have to cook a LOT of fresh spinach to equal the 10 oz you get frozen. Once the spinach is thawed, squeeze out any excess moisture. You want the spinach as wrung out as possible. 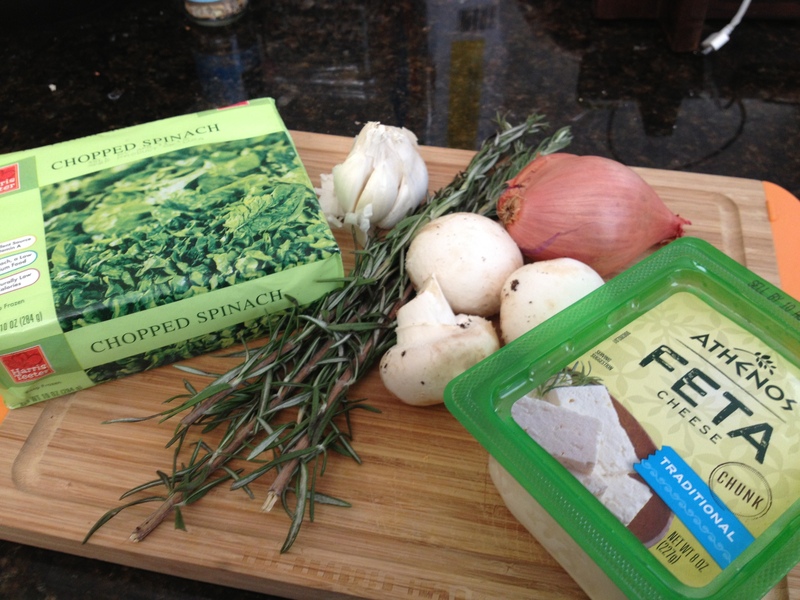 In a large bowl, combine the ground lamb, feta, shallot and mushroom mixture, spinach, and the beaten egg. As always, remove your rings, pull on your latex gloves, and mix by hand. After cleaning out your skillet, set it back on medium-high to high heat with a touch of oil. Once the pan is good and hot, start scooping your lamb mixture into loosely rolled balls of a uniform size and dropping them into the pan to sear the outside. Don’t overcrowd the pan, you may have to do this in batches. After browning them on all sides, transfer to your baking sheet. Once all the meatballs are seared and transferred, pop the baking sheet in the oven and wait about 25-30 minutes. Because of the cheese and the high proportion of spinach, there should be a nice, crisp crust on the outside of the meatballs. You could, of course, omit the cheese if you’re not doing dairy, but if you do that, I highly recommend adding extra salt to your meat mixture. The feta also acts as a salty element that would be sorely missed if omitted. 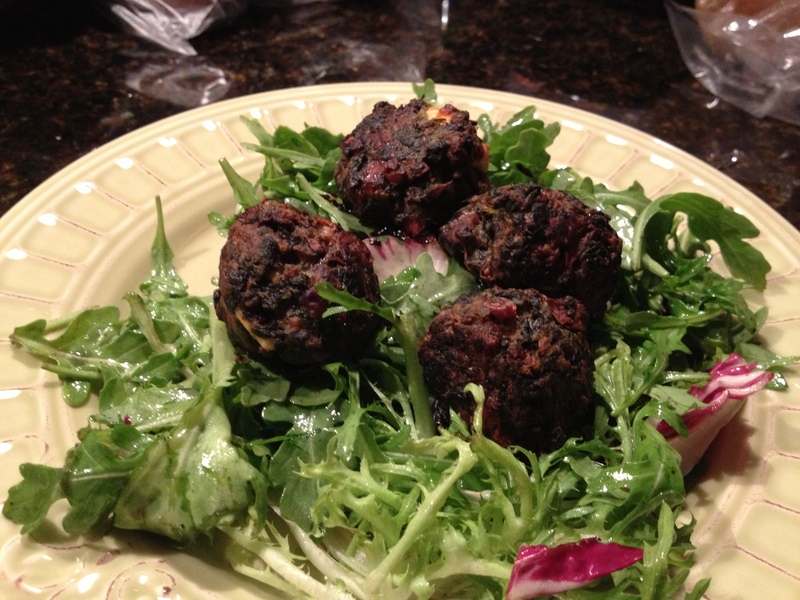 I served my meatballs on top of a baby arugula salad dressed very simply with olive oil, lemon juice, salt and pepper. They were a hit in my house, and I hope they will be in yours! « EATS: Please excuse the interruption.